Happy 78th B-Day to the world’s grandfather of electronic music, Robert Arthur Moog (May 23, 1934 – August 21, 2005). This American pioneer of electronic music who founded Moog Music, changed music forever with the invention of the Moog Synthesizer. To honor Moog, Google celebrates with this interactive doodle of a replica of the Moog Synthesizer – visit google.com and go ahead -- click the keys! Photo, left of the Minimoog,a monophonic analog synthesizer, invented by Bill Hemsath and Robert Moog, released in 1970 by R.A. Moog Inc. (Moog Music after 1972); In 1981 production was stopped. It was re-designed by Robert Moog in 2002 and released as Minimoog Voyager. The Moog synthesizer was one of the first widely used electronic musical instruments. Bands such as The Beatles, which would eventually use a Moog machine on the album "Abbey Road," (released September 29, 1969), wanted a psychedelic sound, and the Moog could provide it. Today, Abbey Road is known as the best Bestles album. Many musicians would adopt Moog machines: including Herbie Hancock and Sun Ra, the jazz greats; the Monkees and Emerson, Lake, and Palmer, the rock groups; even the Beastie Boys, the rap group formed in 1981. A native of New York City, as a child his mother encouraged him to study music and he learned to play piano. He also spent time with his father,an electrical engineer at Con Edison, whose hobby was tinkering with electronics. At the age of 14, Bob built his first theremin. Photo left, Moog with his Boy Scout group in 1945 at 11 years young. When he was 19, Bob published his first article named "The Theremi" in Radio and Television News, in January 1954. That article engendered requests from readers for Bob to create a theremin kit for sale, and thus R.A. Moog, Co. was born. Moog attended the Bronx High School of Science in New York, graduating in 1952. 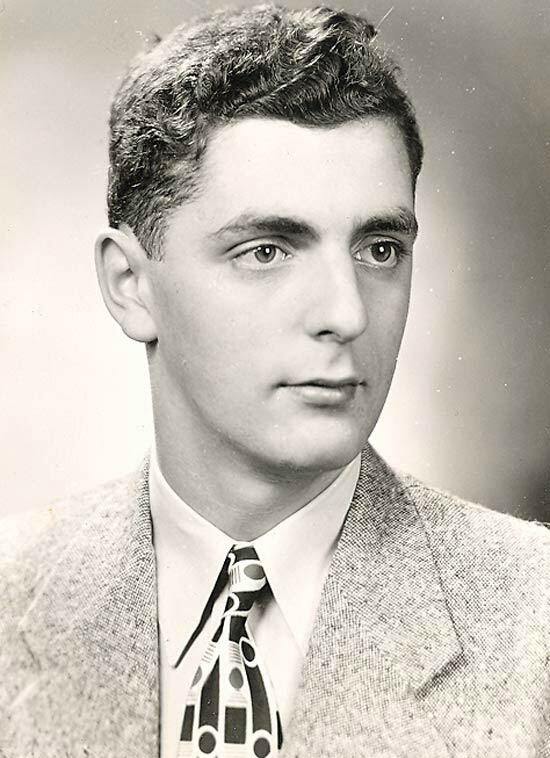 Moog earned a bachelor's degree in physics from Queens College, New York in 1957, another in electrical engineering from Columbia University, and a Ph.D. in engineering physics from Cornell University. 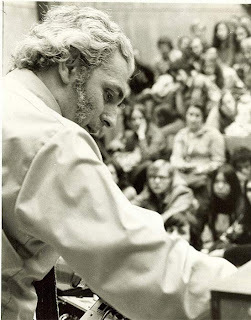 Moog's awards include honorary doctorates from Polytechnic Institute of New York University (New York City) and Lycoming College (Williamsport, Pennsylvania). 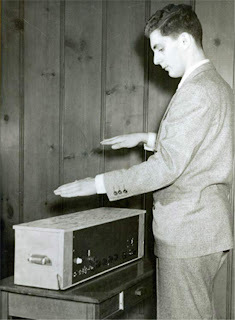 Pronunciation of Moog rhymes with “vogue.” Photo right, 18-year young Moog with his theremin (1952). In 2002 Bob Moog was honoured with a Grammy Award for technical achievements. He died of a brain tumour on August 21, 2005 at 78 years old. Photo right, Moog lecturing at York University, in Toronto, Canada (1974). 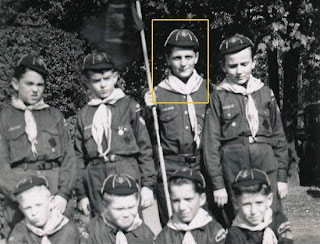 Interesting piece about Robert Moog. I am proud that he was a native New Yorker, and attended Bronx High School of Science. Now I know who the grandfather of electronic music is. Kudos for Moog and NYC. 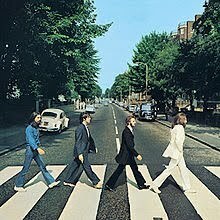 Didn’t realize the Beatles’ album “Abbey Road” used the Moog. I enjoy reading your blogs. Found this information about the innovative electronic music synthesizer very interesting. Moog was quite an interesting person. Found this blog post very interesting. Thanks for sharing. Cool piece about this innovative product. To think Moog invented this when he was only 19 years old. Amazing. I like all the resources you’ve included. I went through a few and really appreciated you adding these articles. I especially liked Moog’s web site and was glad to see that Stevie Wonder also wished him a Happy Birthday on his website that day. The Google Doodle synthesizer is also on that page. And the section on the history of the MiniMog awesome. Thanks for sharing. Now I know Bob Moog was the inventor of electronic music synthesizer. 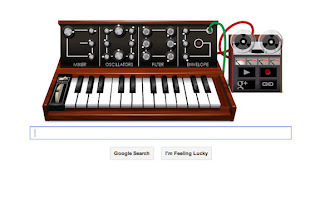 I really enjoyed the cool doodle of the Moog Synthesizer. Thanks Google and to this blog post.